If you have a dual or a triple monitor setup, and you wish to have a taskbar on the second or second and third monitor. Then you should take a look at Dual Monitor Taskbar. 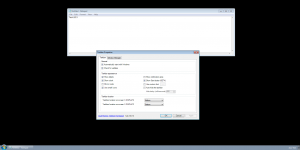 It’s a free opensource program for Windows 7 that puts a taskbar on your second monitor if you have dual monitor setup or on your second and third monitor if you have a triple monitor setup. I haven’t tried a quad monitor setup or beyond, please let me know if you have in the comments. Here is a list of configuration options. Below is a screenshot of the settings, and notepad on a second monitor. As you can see, it’s hard to tell the different from a normal Windows 7 taskbar. If you have a program running on your second or third screen, it will show on the taskbar for that monitor, so it makes it easy to locate your programs windows. There is similar software that you can purchase, however Dual Monitor Taskbar seems to get the job done and is free.